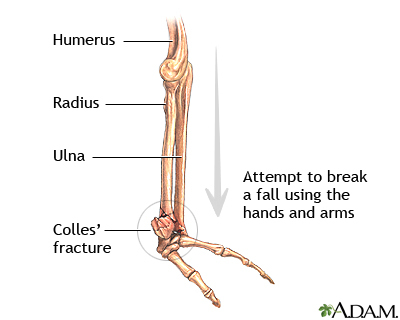 A Colles fracture results in a backward and outward position of the hand in relation to the wrist. Updated by: Linda J. Vorvick, MD, Medical Director, MEDEX Northwest Division of Physician Assistant Studies, University of Washington School of Medicine; and C. Benjamin Ma, Assistant Professor, Chief, Sports Medicine and Shoulder Service, UCSF Department of Orthopaedic Surgery. Also reviewed by David Zieve, MD, MHA, Medical Director, A.D.A.M., Inc.